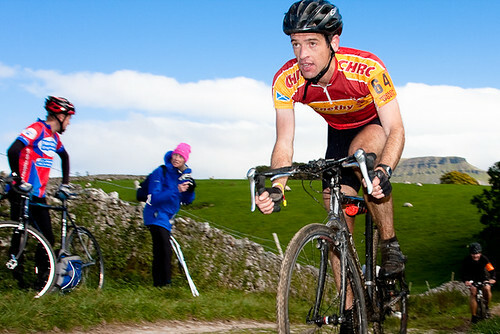 Last year I rode the Three Peaks Cyclo-Cross, this year I didn't. I've avoided racing this year, my race mojo was not with me. Though I've just remembered I competed in the Summer Polaris with my friend Lisa and we won 3rd mixed vet. OK, so I've not ridden many races. As usual in the couple of weeks before entries open for the 3 peaks I get reminders of the entry date, so I can't say I missed the cut off for entering. However I decided that though of course I could get round, that I wouldn't be able to improve on my PB, so instead it was better to let someone else who'd challenge themself, have my place. This was not my only reason though. I really fancied covering this race with my camera. With the bonus that someone was paying me to do so. Like riding in the race, I knew some proper preparation would be needed. The first thing I did was to look and see where those who had gone before had shot their pictures from. From this I learned that there were lots of pictures out there, and that there were some good shots taken from the majority of easily accesible places. Hmm. So with my race knowledge I can think of a few places which might be good spots which don't seem to have been covered. Only thing is they're nowhere near each other. Hmm again. Next how to get about? I could ride a bike on some bits, but along with my cameras, lenses etc on my back, I'd be too slow on the steep bits, and anyway I'd never keep up with the action. So after much gazing at the map I decided on a route along with some useful tips from 3 peaks guru Dave, though more of that in a bit. Now I'd decided on where I was shooting, I had to work out what shots I was planning on doing, where the light would be, and ergo what stuff I'd need to achieve that. Most of my sport photographic work recently has been the sort where if the shot isn't spot on, I can give the shot another go ("can you ride that again please"). In a race situation this isn't an option. So I spent a couple of hours working out some custom camera and corresponding flash settings. I knew there would be no time for faffing. So race day, somewhat fuzzy after an evening spent with multiple former race winner Fred Salmon and friends in the Helwith Bridge Inn, we drive to the turn off for Simon Fell and I set off up Simon Fell. I've got fell shoes on my feet - good. A rucksack weighing 10kg on my back - bad. For those who don't know Simon Fell is steep, for those who do know and have carried a bike up there, it didn't feel that much easier not carrying one. 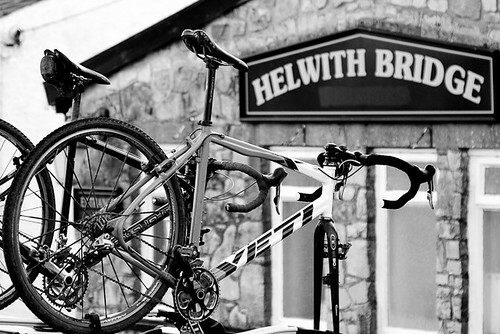 Anyways, I didn't need to race up there I'd got a 30 minute start on the peloton from Helwith Bridge. Once I'd made it to Rawnsleys Leap I set up my stuff, and 10 minutes later Rob Jebb arrived and I took my first shot. A few more clicks of the shutter, resisting the temptation to stay there longer and I legged it. Onwards towards Ingleborough summit in a jogging style, stopping occasionally to grab a few more shots. So far so good. From the summit I retraced my steps and took the footpath down to the Hill Inn. This seemed weird, I was supposed to be taking pictures of a race, and yet I couldn't see any cyclists. Running as fast as my unfit legs can take me, I soon see some riders on the road. I was thankful that I hadn't missed them all. 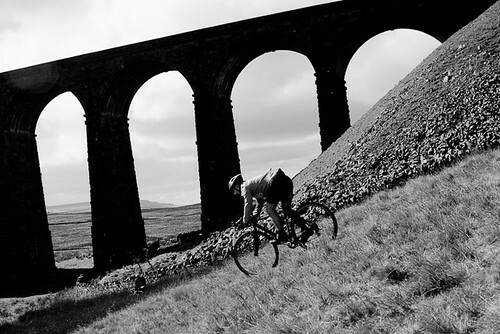 Once with the riders again, a few more shots, and on to the feed station at the bottom of Whernside. More pictures bagged and I have a route choice decision to make. Original planning had suggested that heading up Whernside was a good idea, my schedule now some way down suggested it wasn't. So again I leave the race course and traverse the base of Whernside to the Ribblehead viaduct, running though my legs were starting to ache. 'Twas a good plan I've got back some time relative to the riders. More photography, and we jump into the car (Ann is driving) and over to Horton in Ribblesdale. Gridlock. We aint going nowhere. So back out of the car to capture a few more riders before the car horn going 'beep' signals that Ann's made the junction. Sandwich and Coke downed, I'm hanging out of the car window to get a few more shots. Never tried that before. Fun. Next destination Horton Scar Lane, it's a popular spot always with race spectators, and on Sunday no less so. There's a great atmosphere as the fast riders descend the hill and the slower fight their way up. Some great pictures of grafting riders faces. Not long spent there and finally it was time to return to Helwith Bridge to capture the aftermath, and of course to catch up with friends. A fun day out on the Three Peaks. To race or not next year, we'll see. All the rest can be found here. Postcript, my legs still ache after all that running.